Mozart called his Quintet for Piano and Winds his finest, saying that it received the greatest applause. Applause is appropriate upon hearing this marvelous disc full of piano, winds and orchestra accompaniment. Never much of any instrument overshadowing or stand aloneness, but always together, with remarkable tone balance and pure speaking. Performers here are extraordinary, from superb hornist Brain to clarinetest Walton to bassoonist James and oboist Sutcliffe soaring on the Sinfonia, which is one of treasures of this piece. 5つ星のうち5.0Geiseking and Brain - what else needs to be said! This is a rare and wonderful CD of two great (maybe, the greatest) performers in classical music history. And the seller who sold this product through Amazon, performed to perfection, too. Quick shipping and safely packaged. An itinerant preacher-man from Nazareth once said that come Judgement Day, everything hidden will be revealed. Whether one ends up with the sheep or the goats - what a choice - I want to understand who wrote the Sinfonia Concertante for Four Winds, K 297b. What is the Bermuda Triangle or Roswell compared with this mystery? There's no other work like it in the repertoire. It's the handiwork of a major composer - how else can one explain its melodic content and feel for woodwind? 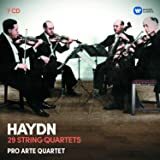 The fact that it is not attributed to Haydn says something about its stature. And yet there's not a scrap of evidence to assign it to Mozart. True, the Salzburg Kid did indeed compose such a work, albeit with a flute rather than a clarinet. He was gyped of the manuscript in Paris but he swore vehemently to his father that he'd rewrite it on the journey home. Thereafter it disappears from view. A century later, a manuscript (not in Mozart's hand) was found in the estate of Otto Jahn. Alas, there was no indication of its origin and the flute had been swapped out for a clarinet. It was immediately attributed to Mozart until the Nineteen Fifties when doubts arose: there are structural anomalies in the first movement which do not bespeak Mozart (the main theme is repeated too often without ornamentation and the episode with the oboe is inorganic in the scheme of things). These issues notwithstanding (perhaps the transcriber tinkered with its structure), it's difficult to avoid the conclusion that if Mozart did not write K 297b in his maturity, another Mozart did. The Adagio - glorious in its majesty and nostalgia - opens with the four note motif that accompanied him all his life - and when the horn makes its entry after the opening bars, who does not undergo a China Syndrome on the spot and meltdown in the core? This disc is contentious. It was awarded a Rosette by the Penguin Guide in an ex cathedra pronouncement. Others regard it wanly. There's little point discussing the four soloists from the Philharmonia in any of these works as their handiwork is transfigurative. My personal favourite is Sidney Sutcliffe on the oboe - what a timbre! And if Dennis Brain had left us nothing but 4'57"ff and 6'24"ff in the finale of the Sinfonia Concertante, he'd still be remembered as a genius. That leaves Uncle Herbert, the contributions of one Walter Gieseking and the recording itself. Karajan has a bad reputation in Mozart, largely stoked by his EMI cycle of symphonies from 1970 (some of which sound over-rehearsed), the marmoreal Don Giovanni from 1986 and his heartless sprint through Le Nozze di Figaro (Decca, not EMI). His Cosi and the 1976 performance of K 543 (DG) are regnant at the other end of the spectrum. Herbie recorded K 297b for EMI in 1971 - it is a spectacular `wipe out on Soup Beach' where not even the surf-board survived. Here in this November 1953 recording, he's in stellar form. Rhythms are well sprung. If he had subsequently conducted all of his Mozart performances in such a fashion, he would never have been associated with a certain word starting with `S' where forks are not required. While no-one can argue against his touch, the tempos that Gieseking sets in the two Piano Quintets are leisurely. I don't care for Beethoven's Opus 16 as it's a minor work but Mozart set great store by K 452; tempo-wise, he indicated Largo-Allegro Moderato / Larghetto / Rondo-Allegretto. To my mind, this schemata vindicates Gieseking's approach. Mozart wants us to wallow in the woodwind. If others prefer a more spring-heeled approach, alternatives abound. Mono though it be, the recording is not without depth and warmth. As the President of the Australian Kna Association, trust me: I've heard worse. The magnetism of the playing will soon win you over. K 297b-wise, this performance has a rival from February 1966: Sinfonia Concertante K.297b & K.364. Perhaps the principals of the Berlin Philharmonic lack the individuality of their British counterparts but what music-making it is, underwritten by a vintage DG recording. Buy both and count yourself blessed. One hardly notices the fact that this recording is in rather boxy mono sound; the playing is of such transparency and delicacy to disarm criticism - and in any case, the ear soon adapts to the ambience which is by no means unpleasing. I'm afraid that while I otherwise applaud and approve his review, I take great exception to David Bryson's description of K297b as "a minor work of spurious attribution to Mozart performed under the baton of Uncle Herbert". It is a sublime piece in a recording I have loved for thirty years; I was delighted when it appeared on this issue. It features the same wonderful artists as in the Mozart and Beethoven quintets, with an orchestra and conductor in top form - no need to be snide about Karajan, especially if one is not even familar with the music. Mr Bryson says that he is "of course unable to offer comment on the filler" and admits that even if he did know it he "would have had next to nothing to say about that in any event" - so why talk disparagingly of it? Having got that off my chest, I urge any music lover to acquire these cheap, classic accounts of some of the most delightful music ever written. While I take exception to his description of this music as "lovely if not profound," the Amazon headnote here by Dan Davis provides an otherwise perceptive description of what is heard on this wonderful Testament CD. 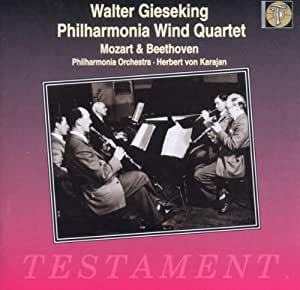 This is some of Gieseking's very finest playing, and the superb Philharmonia wind players are fully attuned to him in both the Mozart and the Beethoven. This Mozart Quintet is vastly superior to Brain's recording made one year later with a lesser ensemble (coupled on EMI with Brain's superlative accounts of Mozart's 4 Horn Concertos). To my taste, the only Quintets that matched Testament's were once on Supraphon LP with pianist Jan Panenka and the delightfully rustic-sounding Prague Conservatory Professors' Chamber Ensemble (Supraphon, would you PLEASE give us a CD issue?). And I fully agree with Davis that Karajan's Mozart here is one of that conductor's best efforts (usually Karajan's Mozart - and virtually everything else he recorded - sounds like excessively smoothed-out, half-hearted Bruckner). This CD may be hard to find, but it is utterly essential listening for anyone who savors chamber music-making at its finest.